In this series, I’m going to be giving you real life updates on my own fitness journey, the Intermittent Fasting Lifestyle, and some of the challenges I face on a daily/weekly basis. I think this will be really useful for you as you’ve read about how to start Intermittent Fasting, and you know all about the benefits of this system versus, say, Keto. But you don’t necessarily know exactly how this system would look like in real life, on a daily basis. Right now I am simply maintaining my physique and my strength. I’m not seeking to change anything. My main two goals are business and career goals for the time being. Therefore seeking to get uber-shredded or uber-strong would compromise these, especially at the level I’m at with fitness. However, it’s likely that I will embark upon a lean bulk at some point in 2019, but the start date is highly variable on how I progress with my other goals. And yes, Intermittent Fasting is an eating system; you can absolutely use it for gaining muscle too (not just fat loss). It will be very useful for preventing excessive fat gain as it will manage my appetite. If I was to hazard a guess, I would say I’m about 10.5% body fat. This isn’t the leanest I’ve been, 8% is the leanest. A true 8% body fat (not what most gym bros say) is very lean, and difficult to maintain without severely sacrificing other areas of your life. It’s not something I’m willing to do right now. 10% is more manageable; I still look great, AND I get a great social and travel life. Win/win. As my goal is to maintain, my training volume requirements are much lower than if my goal was to gain muscle. This article demonstrates the difference between the two levels. I also like to save time by using full-body workouts. I never understood why gym bros insisted upon doing body-part splits; going to the gym 5 times per week, yet only hitting each body part once per week. Crazy. I would much rather hit my body parts more frequently, but without spending so much time in the gym. Deadlifts and squats just tend to be very taxing and difficult to recover from; more so than upper body movements. This is in terms of joints and nervous sytem, not just the muscles. I personally have always had a lower volume threshold for my lower body than my upper body – it’s more of a personal thing. Other guys can blast their legs just as hard as their upper body and still recover, I can’t. 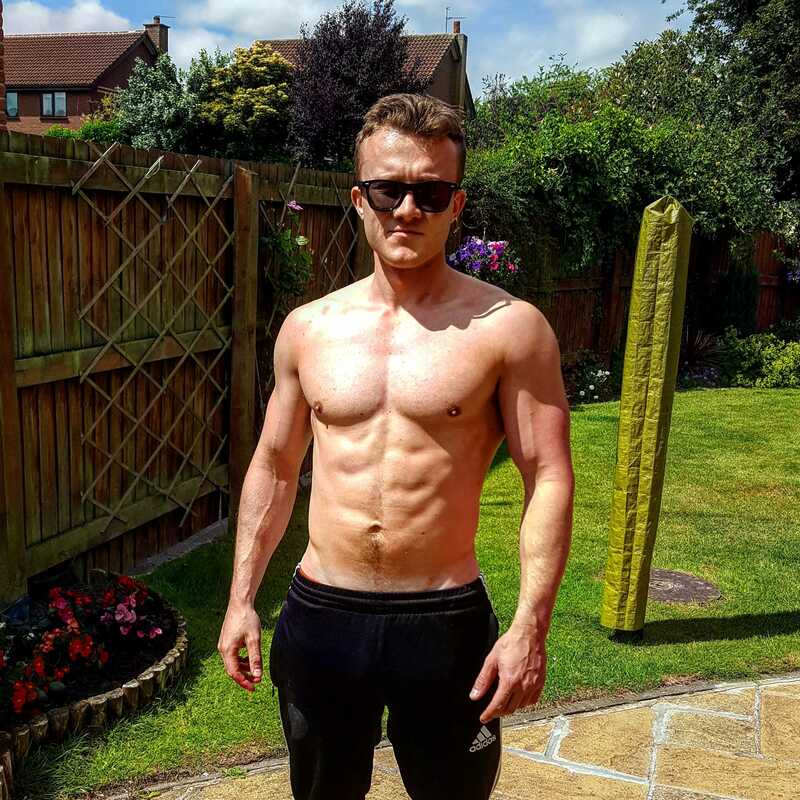 The benefits of two full-body workouts per week is that it gets the job done whilst freeing up more time to attack my other goals and make more money. I’m performing cardio about 4-5 times per week on average; burning about 300-400 calories per session. Over the course of the week it averages out at about 1500 calories in total. This is great – it gives so much extra flexibility and makes it far easier for me to maintain my physique whilst still living a fun life. Without doing my cardio every week. A) Your total calories are spot on. B) You’re not trying to lose weight. Of course the usual Intermitten Fasting structure is in place; morning coffee, a fruit snack at around 11am, then meal #1 around 1pm, meal #2 around 6pm. The food I eat is very, very clean; it’s a habit I’ve built up over time (which is why fitness success takes time, not 30 day diets, or stupid, unhealthy restrictive mindsets like Keto). My only area of non-cleanliness is alcohol. I love red wine, and occasionally I have a few beers. Sometimes G & T’s or G & L’s. This is where doing a decent amount of cardio every week can be a life-saver. Challenges to my fitness at the moment is inconsistencies due to travelling so much. My job involves a lot of travel, and this is just one example of where you would be absolutely f***ed with anything but an Intermittent Fasting Lifestyle. Keto? Nope. Paleo? Nope. Wouldn’t work AT ALL. I eat around 2500 calories per day to maintain my physique. 2200 of these are after 12pm. Usually, about 1500 of these are in the evenings. This means I have a 1500 calorie buffer for any surprises/events/things going wrong in the evening. It’s an absolute life-saver. Compare this to your typical Keto fanboy. He will also eat 2500 calories per day to maintain. But 2/3 of them are gone by 1pm. Now he only has ~800 left for the evening. And, guess what? He can’t have ANY carbs. Good luck only having 800 calories of pure protein and fats and having a decent social and travel life. But yes travelling all the time makes your diet inconsistent; sometimes the food isn’t the best quality in places like Cuba, the gyms are also inconsistent in terms of their quality (but usually good enough to get cardio done, whilst my weight training is always done back in the UK), and I am regularly tired from jet-lag. These all pose significant challenges, but they’re perfectly do-able since my plans are just to maintain. Maintenance is a different ballgame to progression. I will keep you updated on the Intermittent Fasting Lifestyle as time progresses. I would be absolutely screwed without it, and would suffer the miserable fate of most people who attempt diets – throw my hands up in the air and claim that “diets don’t work”, or “diet culture made me fat“, or some other rubbish. This Intermittent Fasting Lifestyle is the best way to get you to your long-term goals, no question.